Automated Moulder/Profile Wrapper by Creative Automation – Creative Automation, Inc.
Creative Automation Builds Processing and Handling Solutions that Integrate with Virtually Any Moulder & Profile Wrapper Equipment. 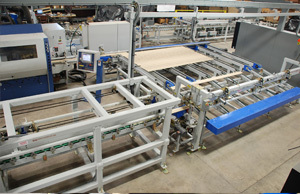 This line integrates Creative Automation custom designed material handling and processing equipment with readily available, standard moulder and profile wrapper equipment provided by other manufacturers. Creative Automation takes responsibility for system integration to ensure that once installed, the entire line works together for optimal production efficiency. 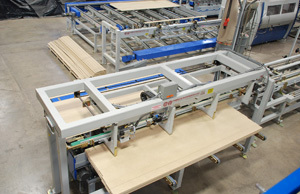 This featured line manufactures door jamb components and miscellaneous mouldings. Door jambs of varying sizes are automatically assembled, wrapped and cut to length. 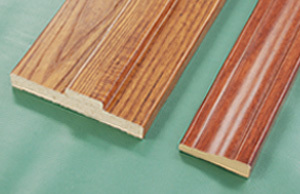 Assorted mouldings are produced as well. 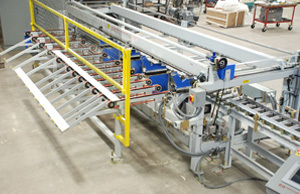 Overall view of the moulder/profile wrapper line. Blanks are fed into the line. Both parts for jambs are fed and glued together automatically prior to moulding. 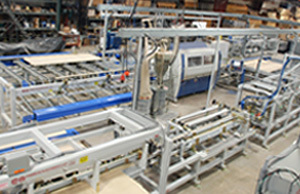 This 180 degree transfer feeds the moulder and serves as a queue area. After the profile wrapper, the flying cutoff saw tracks and cuts on the joint. Finally the crosscut saw cuts the wrapped parts into multiple pieces. 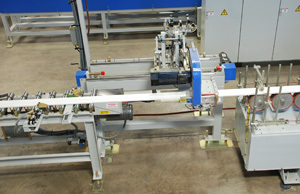 The saw blades setup to position automatically based on the recipe selected.